We are Manufacturers, Importers, Exporters, Traders, Wholesalers, Suppliers of Cardamom at shrihtrading.com. 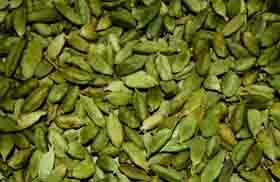 Select wide range of Cardamom from Shrihtrading.com. We offer whole green cardamom which are highly demanded and are widely used all over.Cardamom which is essential ingredient in garam masala, the offered cardamom is provided in two colors with different tastes & help in relieving stomach disorders and heartburn. Our offered range has well-established cookery values and is used in a wide range of sweets and confectionery. 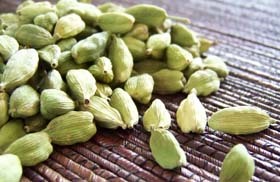 Cardamom available in best wholesale prices at shrihtrading.com. Cardamom is a spice native to the Middle East, North Africa, and Scandinavia. There are three types of cardamom namely, Green cardamom, Black cardamom and Madagascar cardamom. It is best to buy cardamom still in the pods, which are removed and discarded. The optimum altitudinal range on growing cardamom is 600 to 1500 mtr above MsL. The cardamom growing regions of South India lies within 8 - 30 degree N latitudes and 75-78 degree longitudes. Commercial Cardamom is the dried ripe fruit (capsules of cardamom plant) often referred as the “Queen of Spices” because of its very pleasant aroma and taste. Cardamom is a perennial, herbaceous, rhizomatous plant. You can also buy cardamom seeds; however they lose much of their flavor. Ground cardamom has even less flavor than the fresher ones. Most recipes usually call for Green cardamom. Cardamom has a strong, unique spicy-sweet taste, which is slightly aromatic. Cardamom is more expensive than other spices. If a recipe calls for 10 pods that would equal 1 ½ tsp ground. Indian Cardamom is offered to the international markets in different grades: 'Alleppey Green Extra Bold' (AGEB), 'Alleppey Green Bold' (AGB) and 'Alleppey Green Superior' (AGS) are names that register instant appeal worldwide. Cardamom oil is a precious ingredient in food preparations, perfumery, health foods medicines and beverages. India, a traditional exporter of cardamom to the Middle East countries where it goes mostly into the preparation of 'Gahwa' - a strong cardamom - coffee concoction without which no day is complete or no hospitality hearty for an Arab. Indian cardamom enjoys a premium preference in the Middle East, Japanese and Russians who relish it for its distinct enriching properties. The major use is for the preparation of ‘gahwa’ – a strong cardamom coffee concoction which is a symbol for hospitality among Arabs. Apart from this, cardamom is widely used as a flavouring material in whole and ground form. In Asia, it can add a lingering sparkle to every kind of dishes both traditional and modern. In Scandinavian countries it is used in baked goods and confectionaries. In Europe and North America it is an ingredient in curry powder and in some sausages products. Cardamom is native to the evergreen forests of India. This spice is commonly used in Indian cuisine; Cardamom oil and oleoresin have applications in flavouring processed foods, cordials, and liquors and in perfumery and in Ayurvedic & Unani medicines. Usage of Cardamom in daily routine has variety of Health Benefits for treament of a number of diseases, namely, Digestive problems, Constipation & Heartburn, Cleaning of gall Bladder, Urinery Track & Kidneys, fighting Depression, Bad Breath, Mouth & throat Infections, Cold & Flu, Blood Pressure & Blood Clot, acting as Anti-Oxidant, Anti-Inflammatory, Anti-Spasmodic. 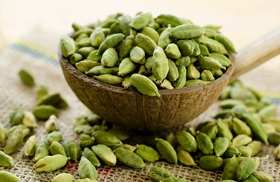 Cardamom is a powerful Aphrodisiac that can help with Erectile dysfunction and Impotence. "CARDAMOM HABIT IS HEALTHY HABIT"
Foreign Matters: Upto 2% Basis. Immature Cardamom: Upto 5% by count Max. Thrips: 3 by count Max. Packing: Standard packs of 1 or 5 Kg in PP bags with a Master Carton of 40 Kg (8 x 5 Kg) or 25 Kg Jute Bags with PP Inner Lining / PP bags, as per customer requirements. Quantity: 20 feet Container / (9 – 10) Tons approximately. We can also supply Small quantities of Green Cardamom as a Trial Shipment to test the Quality with a Minimum Order Quantity of 500 Kg by Air or by Courier or by Sea Freight as per the requirement of Buyers, followed by their Full Container Order. Port of Loading: Tuticorin, Chennai or Cochin, India. Port of Discharge: As per customer requirements. Shipment Terms: FOB / CFR / CIF as per Inco Terms 2010 and as per Customer requirements. Pre-shipment Inspection: SGS or FDA as per customer requirement for Weight and Quality. Mode of Payment: 50% Advance by T/T, 50% by Irrevocable L/C.